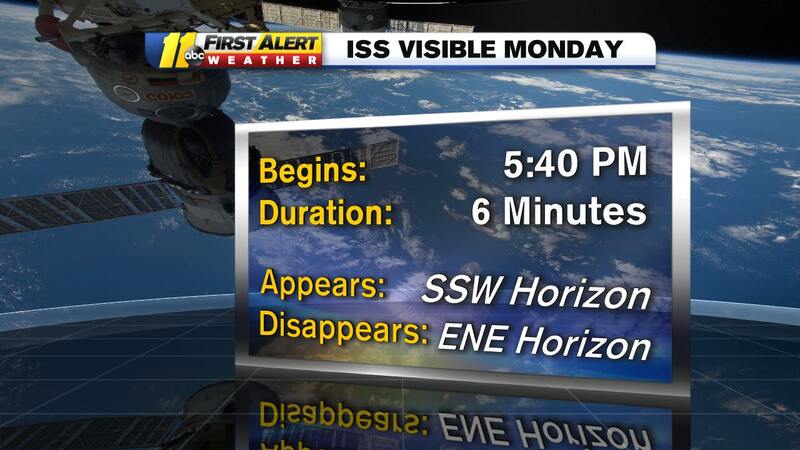 The International Space Station (ISS) was visible Sunday evening around 6:33, but if you missed it you're in luck! We'll have multiple opportunities to see the ISS this week. You can view it with the naked eye; a telescope is not needed. The space station looks like a very bright star moving across the sky, but it doesn't have flashing lights or change direction. It will also be moving much faster than an airplane. According to NASA, the ISS flies at 17,500 miles per hour compared to an airplane that usually travels at about 600 miles per hour. Here are the different days you can view the Space Station. The ISS will be the brightest on Wednesday.